Dot has had so many apologies for Thursday from people on holiday or attending other events that we have decided to cancel the session this week. 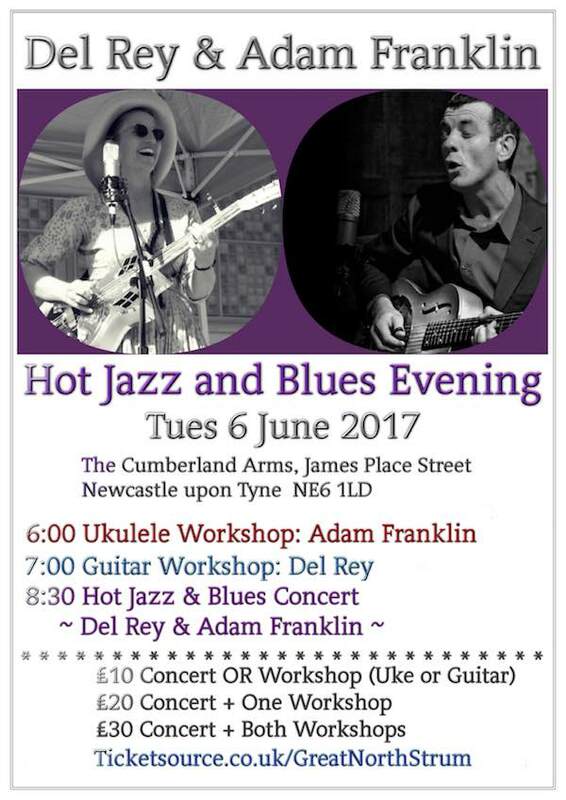 If you are missing your regular uke-fix, don’t forget that on Wednesday 25th we have a wonderful workshop and concert at The Cumberland Arms! 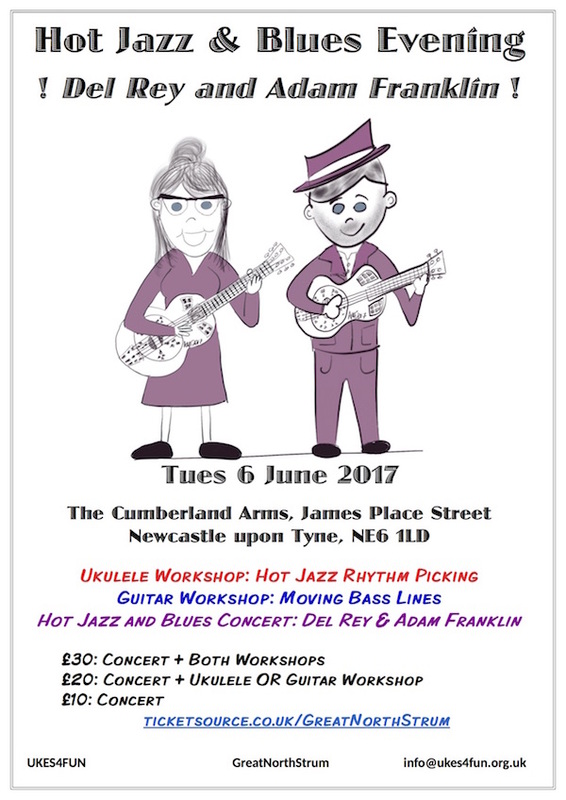 There are still a few tickets left for the Clawhammer Ukulele Workshop by Aaron Keim. These £20 “full tickets” include free entry to the Concert by “The Quiet American” (Aaron and Nicole Keim) with a special guest appearance by “Danielle Ate The Sandwich”. “Concert only” tickets are only £5! 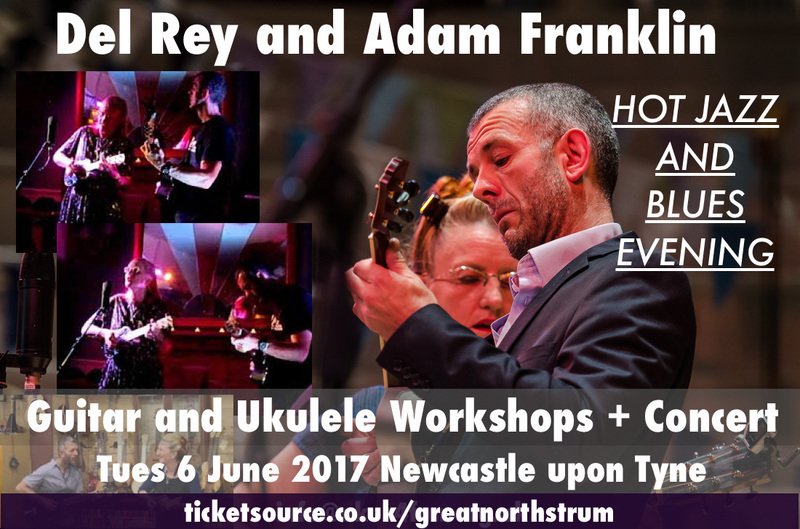 “The Quiet American” and “Danielle Ate The Sandwich” are headlining the Grand Northern Ukulele Festival (GNUF) at Huddersfield this weekend. Many thanks to GNUF for giving us a chance to see them in Newcastle! ps. Many thanks also to GNUF for accepting my application to play at the Vinyl Tap Open Mic on Saturday 28th May! I am rather awestruck at being featured as a “Performer” alongside these amazing people! Wonderful workshop and performance by Mike Hind on Wednesday 30 Sept! From Stage Fright to Spotlight! Here are Mike and some of the participants who banished their butterflies! Who thought we were joking when we called for Mike to do “Bohemian Rhapsody” on the ukulele? After the show, an impromptu treat in The Cumberland Arms Beer Garden! Iain Glencross aka “Hawaiian Shirt Racer“, previously the most stage-frit man on the planet, undertook a six-hour round trip by motorbike to come to the Mike Hind night – and aren’t we glad that he did! Not forgetting lovely Lalya Gaye, who provided soothing ukulele-themed sounds from the Hello Montoya DJ Collective and then was first up in the spotlight to tackle her stage fright! Kay Mortimer was next up, quickly corralling Michael Grant, also from The Angel Delights Ukulele Club in Wooler, to join her on stage – and didn’t they do well too! Many thanks to everyone for making this such a great night! The Cumberland Arms for continuing to support our musical education and adventures! Grand Southern Ukulele Festival for organising Mike’s UK Tour – he will be doing his workshop there on Sat 10 Oct! Matt Warnes aka “Matt Fuddle” of “Feckless, Fuddle and The Fossils” – check out their Cumbrian Mini-Tour this weekend with Mike Hind and Zoe Bestel! Aaron Tucker, Dennis Bell and Tommy Stephenson – ace “workshop elves” – for making it all go so smoothly on the night! Sign up here for our Events eNews for info about future events – there are more in the pipeline!